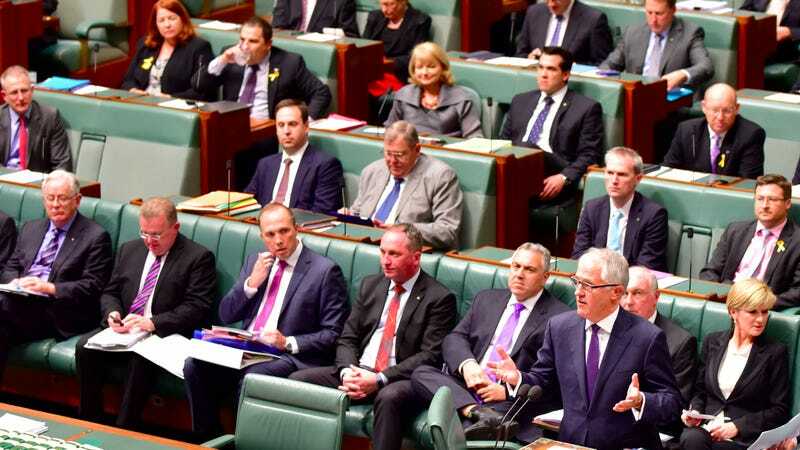 Life’s a little less logistically complicated for the nursing mothers of the Australian House of Representatives, who—thanks to new, deliberately more family-friendly policies—can now breastfeed in chambers instead of having to trudge back to their offices. The changes come after some controversy surrounding Assistant Treasurer Kelly O’Dwyer, who was last year asked whether she had considered expressing more milk to avoid missing her parliamentary duties. A previous parliamentary paper listed numerous examples of serving politicians bringing their children into the chamber, including Senator Sarah Hanson-Young, who was forced to remove her then two-year-old during a division in June 2009. “No member, male or female, will ever be prevented from participating fully in the operation of the Parliament by reason of having the care of a baby,” said Leader of the House Christopher Pyne as he announced the change. “It’ll be a long time, and possibly never, before this job is truly family-friendly, but this is a significant way of trying to improve,” said opposition leader Tony Burke. Not that the moms pleased with the change are necessarily planning on taking advantage. Said Kate Ellis, the AP reports: “While I support maximum flexibility for parents in the workplace, I have absolutely no plans to take my child into the chamber if I can avoid it.” Understandable; after a certain point you’d probably run for public office just to get five minutes to yourself. As the changes only apply to the House of Representatives, unfortunately the women of the Australian Senate are still, thus far, out of luck.